Winter can alter soil pH, compact the soil, and create conditions friendly to weeds and disease, so it's crucial that you properly clean, fertilize and mow your lawn early in the season. Rake up last year's leaves and matted grass that were hidden under last fall's leaves and sticks left in the yard. This can keep the thatch level at a half inch or less. It will also allow you to care for the lawn properly. Raking has the added benefit of loosening the surface of the soil, encouraging healthy airflow. Thatch is a layer of decaying organic matter between the grass plant and soil surface. Excess lawn thatch or heavy organic debris buried under the grass surface can starve the roots from essential nutrients and can create an environment for disease and insects. It can also interfere with your fertilizer and any other applications you may apply to your lawn. A thatch rake will clean out the problem or you can rent a power rake. After you finish raking up/thatching give your lawn a good close mowing. The main reason for aerating is to alleviate soil compaction. The soil in lawns becomes particularly compact in heavy traffic areas. Aeration involves perforating the soil with small holes to allow air, water and nutrients to penetrate the grass roots. This helps the roots grow deeply and produce a stronger, more vigorous lawn. Ideally, aerate the lawn with cool season grass in the early spring and fall. For the best results, use an aerating tool or machine that actually removes plugs of soil or use lawn aerating shoes. Over time, grass does get old and needs to be replaced/reseeded. Worn-out lawns invite weeds. Reseeding is a fast, inexpensive way to help bring your lawn back to its lush, green, healthy self without tearing everything out and starting over. If you put down a layer of seed over your lawn in the spring or fall, all the thin areas start growing grass, and your lawn will look lush and full again. For seeding, you'll want to cut your grass a little lower than normal. Also, remove the clippings. This will allow the grass seeds to get down to the ground more easily. To help the seed settle we recommend that you rake in a fresh thin layer of soil amendment over your lawn. Don't put so much down that you kill your grass; less than a quarter of an inch is plenty. Our very own Organic Soil Amendment Bumper Crop is perfect for reseeding lawns. The grass seed you choose depends on where you live and the conditions in your yard. For instance, if your lawn is full sun, sun and shade or full shade, choose accordingly. It is also important to choose grass seed that is formulated to grow best in your area. 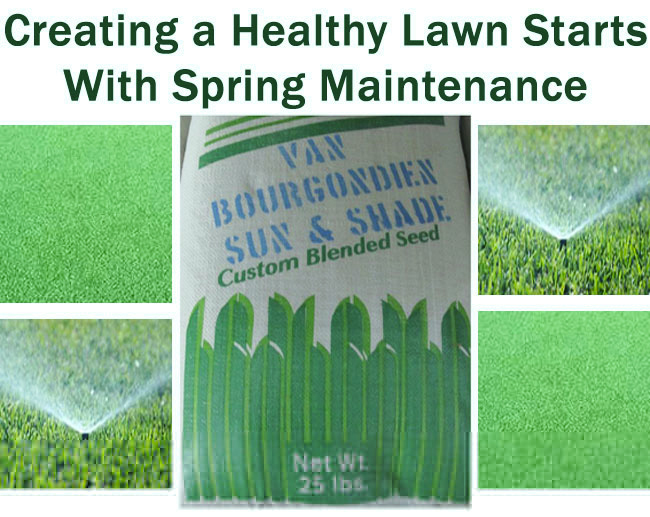 At Van Bourgondien Nursery we carry our very own label grass seed that is formulated by a local sod farm just for us as well as other popular brands. Having a healthy lawn also requires proper soil pH. Testing your soil pH is always a good idea as it tells you what nutrients your lawn needs. (Van Bourgondien Nursery offers Free Soil Testing and also sells soil testing kits) You should feed/lime in early spring, late spring, summer, and fall. We recommend 4-Step Fertilizer programs because not only does the 4-Step Program provide your lawn with the proper nutrients for each season, but each step also contains a problem solver such as weed prevention, weed control, and insect control. Purchasing a 4-Step program is the easiest and most economical way to have a great lawn. If there are a lot of bare patches that need re-seeding there is a special 4-Step Lawn Program just for this purpose! Van Bourgondien Nursery is running Rebate Specials on Scott's 4-Step Programs which includes a free $50.00 Gift Card to restaurant.com with any purchase of a 4-Step Program. Water deeply (longer) and less frequently to encourage deep root growth. Frequent shallow watering's encourage weed germination, and it can also cause the grass plants' roots to grow very shallow, leaving the plant more susceptible to drought and to certain diseases. Watering only when your grass really needs it encourages the roots to grow deeper, but only if you apply enough water each time to penetrate the root zone. Over-watering can be just as bad for your lawn's health and can contribute to the development of fungus and disease. When you use sprinklers, some water evaporates before it hits the ground. On a hot, windy day, the amount of water that never reaches your grass can be substantial. To reduce loss to evaporation, water sometime between 4 A.M. and 9 A.M., when the air is still cool and the wind is usually at its calmest. Watch the weather and if the forecast calls for rain let the rain do the work for you. Nothing looks more wasteful than running your sprinklers while it's raining. If your sprinkler system is on a timer, get and install a rain sensor that automatically turns the water off when it rains. You can conserve water by letting Mother Nature help you out! Proper mowing is one of the most important practices in keeping your lawn healthy. Height does count and most grasses have a range of recommended mowing heights. Stay at the upper end of that range when the lawn is under stressful conditions, such as hot weather or drought, or if you have a shady lawn. In cooler weather, you can cut the grass a little lower. Mowing your lawn too short can also create a more perfect environment for the weeds and not your lawn. The ideal height recommend for grass is at least 2-3 inches. Make sure the the mower blades are clean and sharp, this causes less stress on the lawn and also helps to prevent the spread of disease. Having a luscious well manicure lawn really isn't as difficult as it may seem. 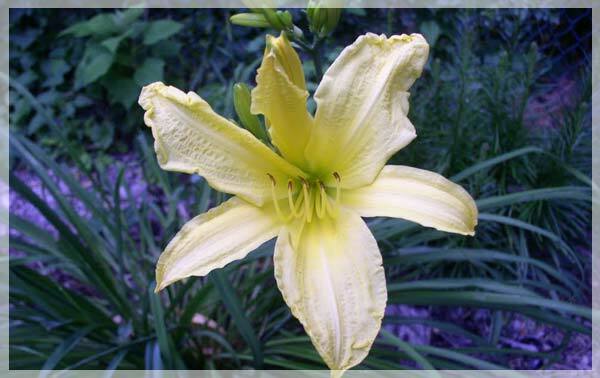 Van Bourgondien Nursery is here to help you!